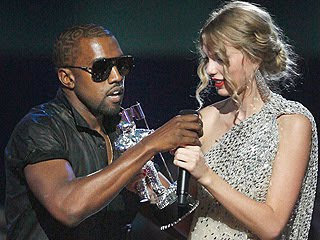 As Taylor Swift accepted the Best Female Video award (left, photo credit AP) for You Belong With Me, rapper Kanye West ambushed the stage, interrupted the young country star's speech and stated that Beyonce should have won for Single Ladies (Put A Ring On It). He stated: "Yo, Taylor, I'm really happy for you, and I'm going to let you finish, but Beyonce had one of the best videos of all time," he shouted. "One of the best videos of all time!" Swift was stunned and speechless, and when the cameras panned to Beyonce, she looked stunned as well. The crowd booed Kanye off the stage and the show immediately cut to commercial. Later on during the show, Beyonce let Taylor have her moment when Beyonce won Video of the Year. She got onstage and asked Swift to join her. "I remember being 17 years old, up for my first MTV award for Destiny's Child and it was one of the most exciting moments of my life," she began. "So I would like for Taylor to come out and have her moment." Taylor was overwhelmed by the R&B star's support, stating: "They told me to stand by the side of the stage, and I didn't really know what was going to go down. But I thought it was so wonderful and gracious of her to do what she's always done. She's always been a great person before anything else. Before the talented artist, the superstar, she's always been a great person and I just, I thought I couldn't love Beyonce more tonight, than tonight." She continued: "I've been getting so many text messages and everybody's been really nice. So I've had a really, really fun night. It's been interesting definitely. It's definitely been an interesting night." She also said that many celebrities reached out to her backstage. Even Pink took Taylor's side, tweeting: "Kanye West is the biggest piece of s*** on Earth. Quote me." Taylor isn't holding any grudges toward the rude rapper, stating: "I don't know him, and I've never met him, so ... I don't want to start anything, because I had a great night tonight."